Punti Necessari: 2500 Please note that, for now, you cannot download content from our platform directly onto a mobile device (phone, iPod, iPad, tablets...). You need to download your items onto a PC or Mac, and then transfer them onto your device in the normal way. We are working on allowing direct downloads to mobile devices but this is not possible in the current version of the platform. Sorry about the inconvenience! NOTICE: Activation key must be used on a valid Steam account, requires internet connection. ABOUT THE GAME	Cuban Missile Crisis (English, Deutsch)	Cuban Missile Crisis : Ice Crusade (English)	CUBAN MISSILE CRISISCuban Missile Crisis is a real-time strategy game combined with a global turn-based tactical mode, thrusting gamers into a world ravaged by the military-political co… nfrontation between the USA and USSR in 1962. Cuban Missile Crisis offers an alternative interpretation of the events that followed the infamous nuclear stand off between the United States and Cuba. As the stalemate collapsed, the two superpowers unleashed their nuclear arsenal on the world, leveling its metropolitan expanses and leaving scorched radioactive deserts. The cities that managed to survive the disaster realized that the most precious resources were now clean earth and water. The remaining world citizens found themselves in a war fighting for their very survival. Cuban Missile Crisis provides an interesting mix of real-time battles and a turn-based global strategy mode, forcing players to use tactical troop movements while managing resources and armies. Conquer new resources, track new borders, create a new map of the world. KEY FEATURES	Dozens of missions, through the four sides of the conflict (USSR, the French and German alliance, China, the American and British alliance). New types of weapons and equipment including helicopters, rockets, reconnaissance troops, etc. Radioactive contamination zones that have an influence upon military equipment and troops. 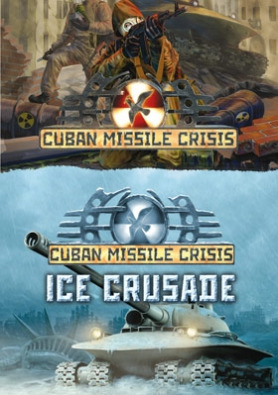 CUBAN MISSILE CRISIS: ICE CRUSADE	Cuban Missile Crisis: Ice Crusade is the follow-up (stand-alone) to the RTS Cuban Missile Crisis which shows a new span of the military confrontation in alternative history.1967. The Cuban Missile Crisis that led to World War III continues. Use of nuclear weapons resulted in global cooling which changed history and aggravated the struggle for survival. Inspired by the takeover of Europe and Africa the Soviet government decides to start an unprecedented military operation called Ice Crusade. Soviet expeditionary forces march over the Arctic and attack unguarded American cities and towns. Deserted areas of Mexico and icy American megapolises become the new battle-grounds. KEY FEATURES	Turn-based tactical mode and a real-time strategy in one game. New battle-grounds: southern part of the USA and northern Mexico. 2 new campaigns – USSR and USA. 10 scenarios and over 25 strategic missions. 22 new military units including T-60, Hunter, Chieftain, Grand MLRD, Akatsia self-propelled gun. 2 new super units – Convair-49 and Tyulpan 240mm self-propelled mortar.SYSTEM REQUIREMENTS Minimum: OS: Windows® XP (SP3) / Vista (SP1) Processor: 800 MHz and above Memory: 512 MB RAM Graphics: 64 Mb VRAM and more Hard Drive: 4 GB Recommended: OS: Windows® XP (SP3) / Vista (SP1) / Windows® 7 Processor: Pentium IV 1.8 GHz or higher Memory: 512 MB RAM Graphics: 3D accelerator AGP 4x with 128 MB RAM Hard Drive: 4 GB Compatibility: Windows XP, Vista, 7, 8, 8.1, Windows 10 © 2005 1C Company. Developed by G5 Software. All rights reserved. This product contains software technology licensed from Nival Interactive. © 2006 Nival Interactive. Nival, the Nival logo and the Enigma Engine logo are trademarks of Nival Interactive. All rights reserved. Uses Bink Video. Copyright © 1997 - 2006 by RAD Game Tools, Inc.